It comes complete with power supply, manual, Midi leads, Jack leads, Official Roland Dust cover, and a Custom made Aluminum Rack Tray for use on angled 19″ Desktop rack. This unit has had the Free Roland Upgrade of the main chip, which apparently smoothed out the bugs in the earlier versions and gave better midi implementation. Never Gigged, just home acid tweaking!!!! The MC-303 is an exciting new product that presents new creative approaches to dance music. Dance music, especially techno music, can now be approached creatively by anyone using the MC-303. All that’s required is just to combine any preset sounds and patterns from the huge selection offered, including sounds from vintage analog synthesizers. Realtime performance capability is emphasized, such as realtime Cutoff and Resonance controls to vary the sound as well as Arpeggio and Groove Quantize for adding a special feel or groove to the song. The self-contained MC-303 can offer a level of performance which has been only available with huge set-ups including turntable, mixer, and various instruments. The MC-303’s integrated features provide advanced DJs with another innovative way of creating techno music. With its 120 Preset Patterns and an awesome 448 Tones and 12 Drum Sets, the MC-303 has everything to get you up and grooving within seconds.The Preset Patterns and Tones cover various facets of modern dance music, from Techno, Jungle, Trance to House, Acid Jazz and Hip-Hop. The MC-303 comes loaded a selection of vintage analogue sounds that are so typical of dance music: TB303 basses, SH-101 basses and solo sounds, Juno and Jupiter sounds, synth pianos, etc., and of course scratch noises, orchestra hits, white noise, TR-909 and TR-808. Techno and Jungle drum sets are also included. The Preset Patterns can either be used ‘as is’ or customized by muting some parts (the chord backing, for example) and then stored to one of the 300 Variation memories. Original Patterns can be created either by modifying existing Preset Patterns or by programming them in real-time or step time. The MC-303 provides 50 User Pattern memories. Pattern sequences can either be programmed in real-time or as Songs for repeated use. The MC-303 is essentially a real-time performance tool, providing four large knobs for recordable sound parameter editing (filter, LFO, envelope, resonance, etc. ), Real-time Phrase Sequencing (RPS), and advanced arpeggiator with more than 30 styles, and sophisticated Quantize functions (Grid Quantize, Shuffle Quantize, and Groove Quantize). The MC-303 also features a Low Boost knob allowing you to dial in as much low-end as it takes to create powerful Kick or bass sounds so that anyone can ‘feel’ the groove. The BPM rate can be specified down to the first decimal place for precise synchronization with external sound sources or by using the Tap Tempo function. 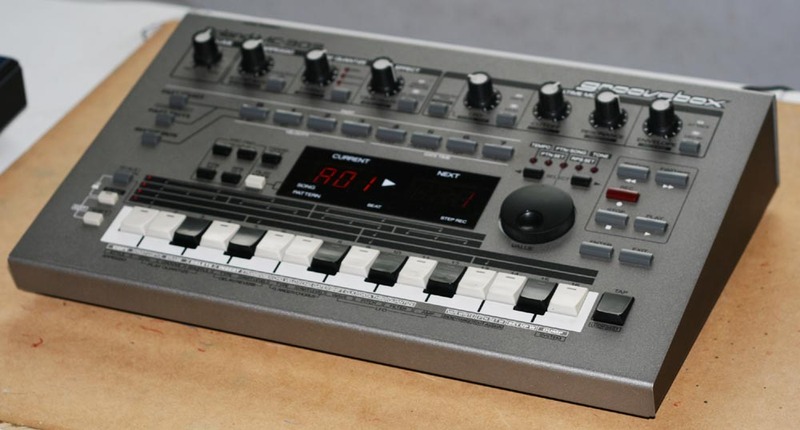 The MC-303 also sports a MIDI IN and a MIDI OUT connector to interface with external MIDI compatible equipment.